I actually like WebSphere. Honestly I do. But it really really does not like Domino and Domino is my first love (well 2nd love.. ccMail you’ll always be first in my heart). I have always run into problems configuring Domino within WebSphere mostly due to the fact that Domino LDAP isn’t always hierarchical the way every other LDAP is. Back in the original Sametime 8.5 days we couldn’t have users of ST who didn’t have hierarchical names and we used to have to fake a hierarchy (C=US) to trick WebSphere. My latest hair tearing out insanity is shown below. To configure external users for Connections you can choose to set up an alternate LDAP source – in this case I’m using a dedicated Domino server I can make publicly available for people to register themselves. 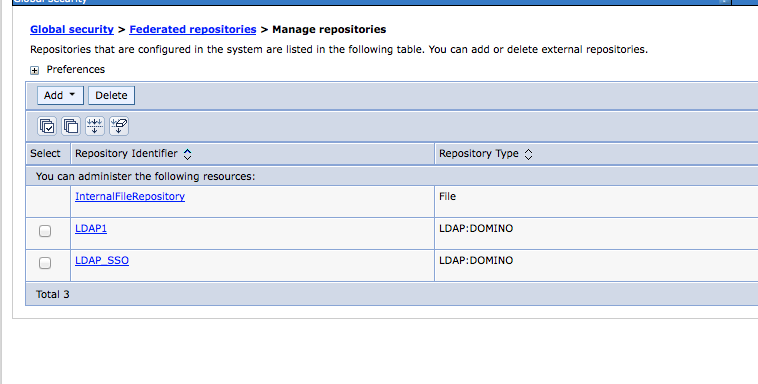 Here are my repositories set up in WebSphere showing the two Domino LDAP sources..
As soon as I added the external Domino LDAP repository it changed the original internal one to the external one so that’s listed twice. Try and add it again and it adds the same one a third time. Even more hilarious, only the original (unlisted) one actually works and lists / authenticates users. Hi, im also struggling with Domino LDAP and WAS federated repository. I found the Domino LDAP Patch on openNTF but could not figure out how this is working. Can you give some advice how to patch the pubnames template? I placed the .jar into jvm/ext/lib and tried to start domino jvm from that directory with “jvm/bin/java -jar LDAPFixForDomino.jar pubnamesmod.ntf”. Can you elaborate on your problem? When I use Domino as LDAP against WAS I always just use the regular pubnames.ntf on the server, no customisation required. Depending on the version of WebSphere you are using you can use “root” as the Base DN to pick up all groups and non hierarchical users.